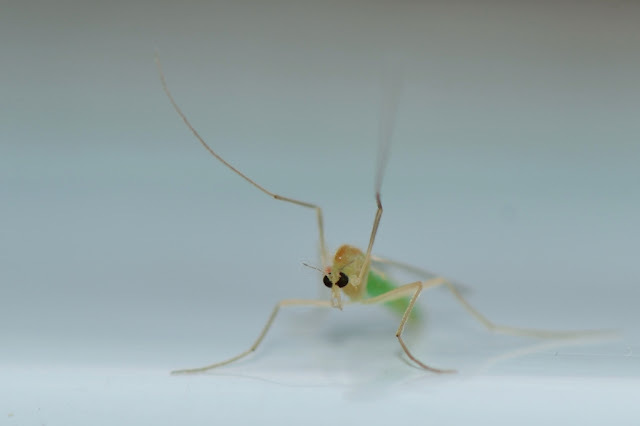 Meet a midge that hatched from the sand-spring! ... however, it is just doing what chironomid midges do... they habitually raise their long forelegs and wave them around. 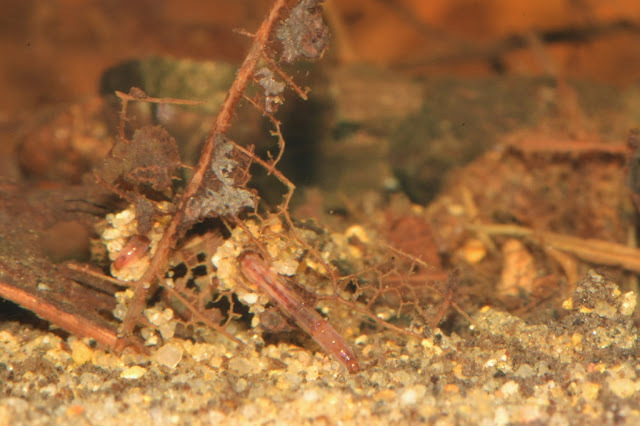 I brought home some sand and such from the bottom of the spring and placed this "stuff" in an aquarium for observation. 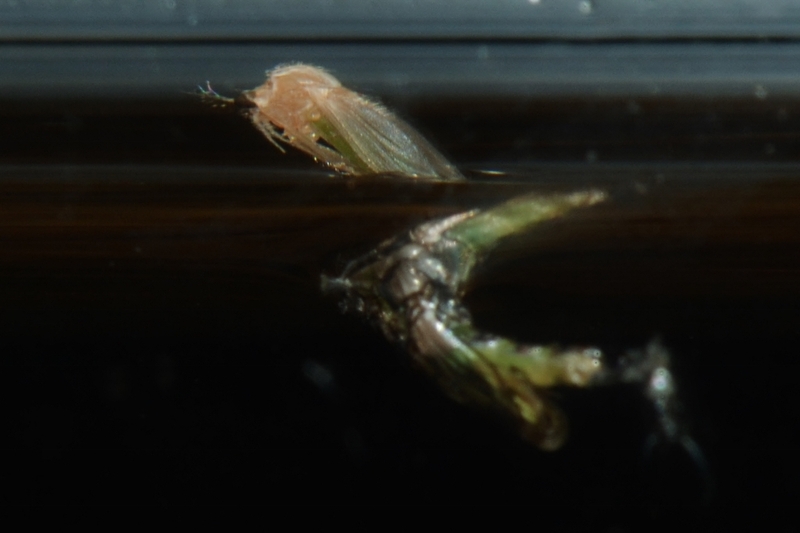 Soon some midge pupae began to hatch. 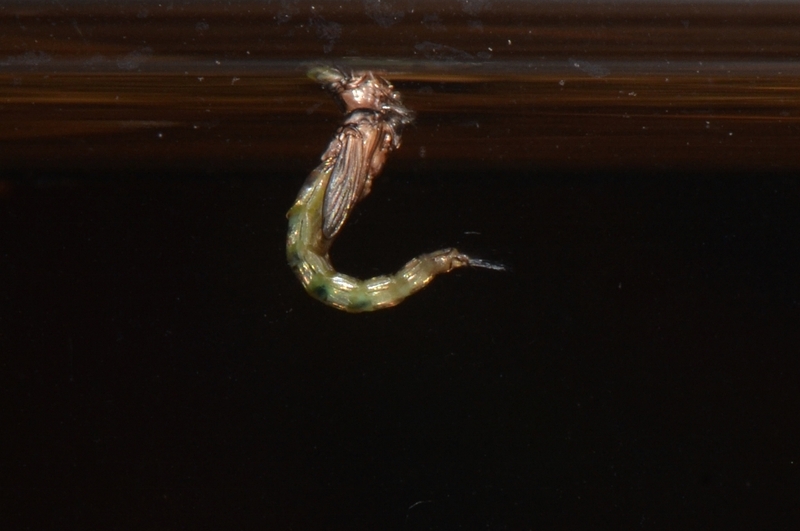 This photo shows a pupa a second before the midge began to emerge. 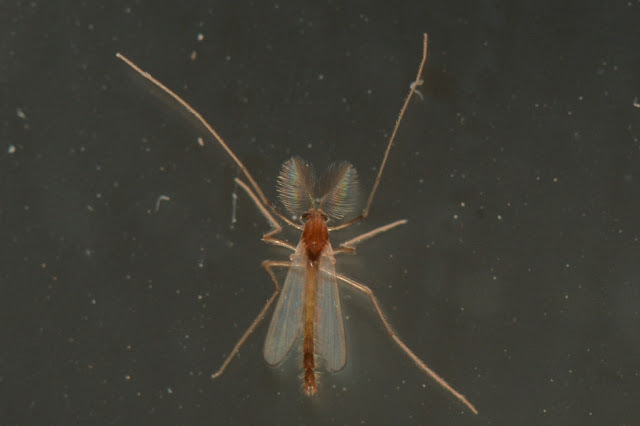 Here comes a brand new midge! What a moment to witness! The boiling-sand spring (which I've been posting about) is populated, among many other things, by many tube-dwelling midge larvae. 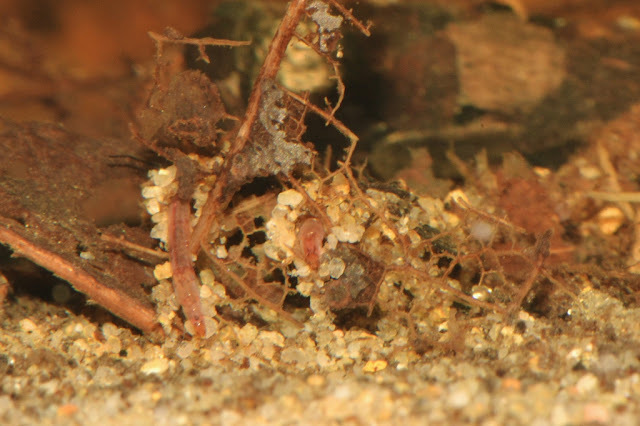 I'm assuming the midges that hatched came from these sand-tubes, because they are so abundant and I have seen very few other midge larvae in my aquarium. 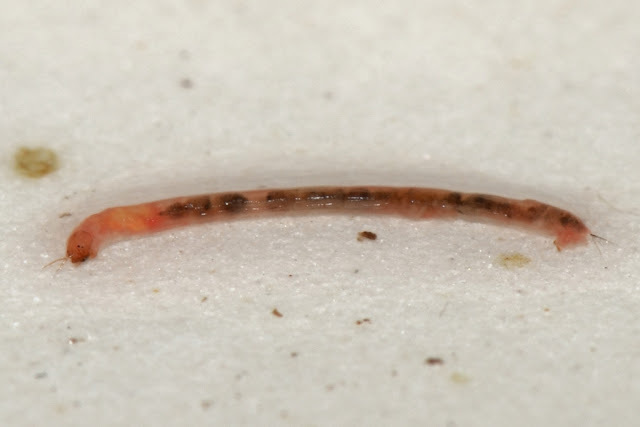 Here are photos of a midge larva that I coaxed from its sand-particle dwelling. 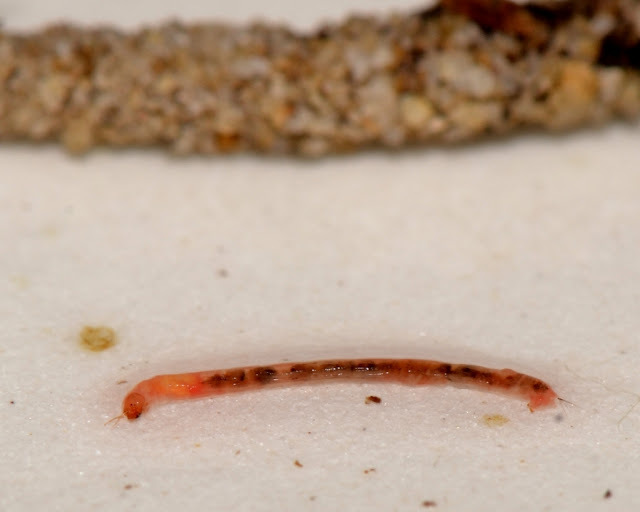 Some midge larvae get the name, bloodworms, because of their reddish color. Here is a photo of a midge larva with a sand-tube in the background. These midge larvae seem to be workaholics. You'll see why I think that when you compare the size of a midge to its sand-tube dwelling. 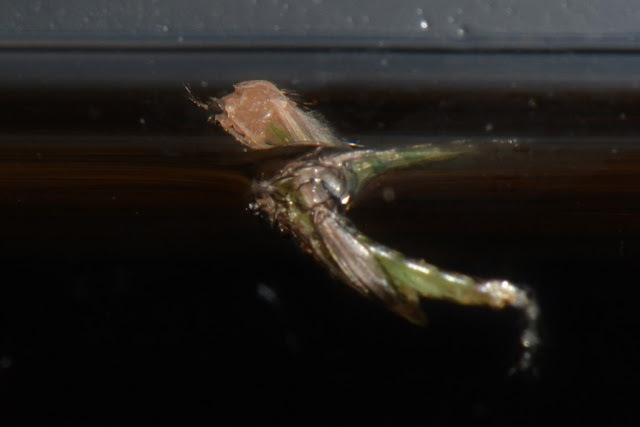 The midge larvae are really serious about tube-making. 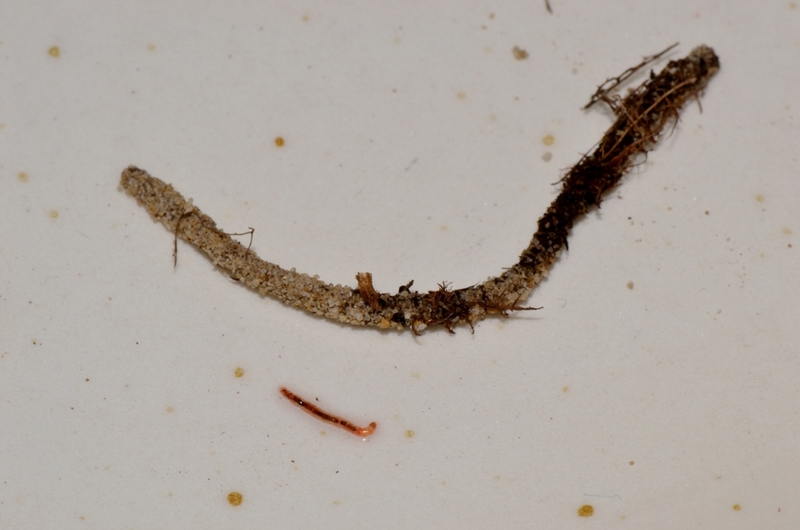 This midge larva measured less than 1/4 inch long while the tube was almost two inches. That's alot of gluing sand particles together with salivary secretions. 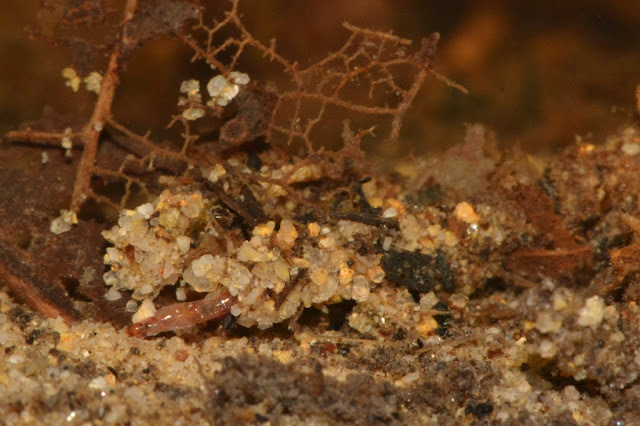 Here are a few photos of midge larvae building their tubes with grains of sand and other particles that they gather from their aquatic environment. They stretch out of the mouth of their tubes and grasp pieces of sand. They pull back in with some particles and cement the pieces of sand on the leading edge of their tubes. 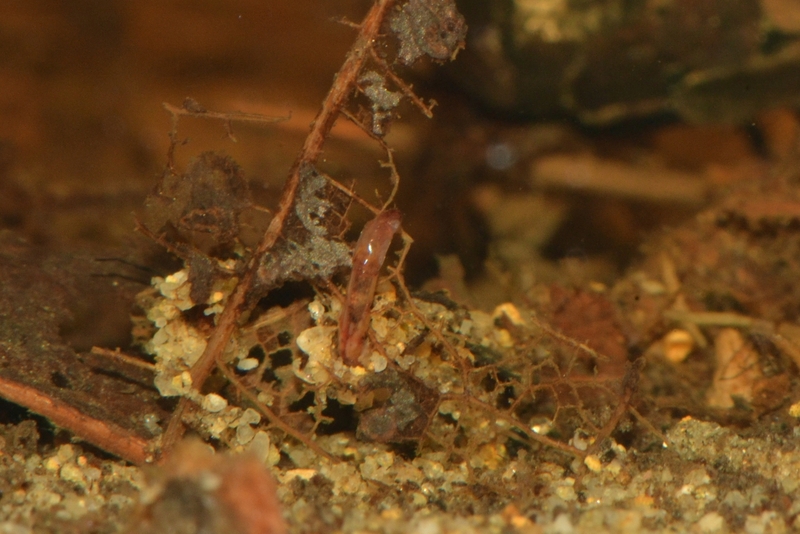 I gather these particular midge larvae feed on detritus ... I've seen them act like they are feeding on leaf fragments as in the picture below. 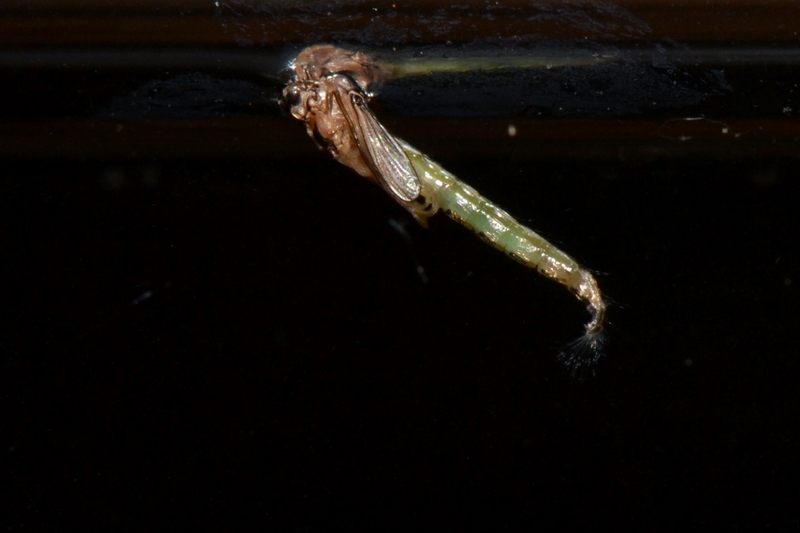 The midge larva in the photo below was working a long time on the leaf fragment it has pulled into the mouth of its tube. 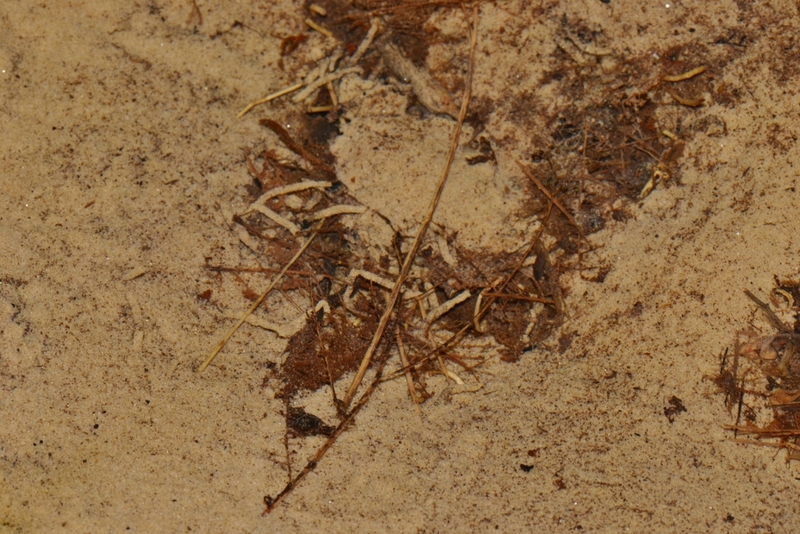 Notice how that midge's tube protrudes from the sand? Here are a few more tubes that do the same. We did an experiment to see if these protruding tubes have a higher occupancy rate than the tubes scattered on the surface... like the ones in the photo below, or the tubes from thick hash in the second photo. We were surprised at what we found... 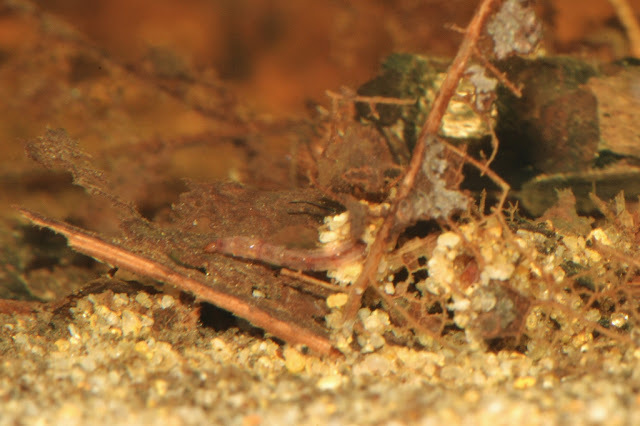 The protruding larval tubes had only about a 10% occupancy which was the same as the light colored tubes scattered on the sandy bottom of the spring. 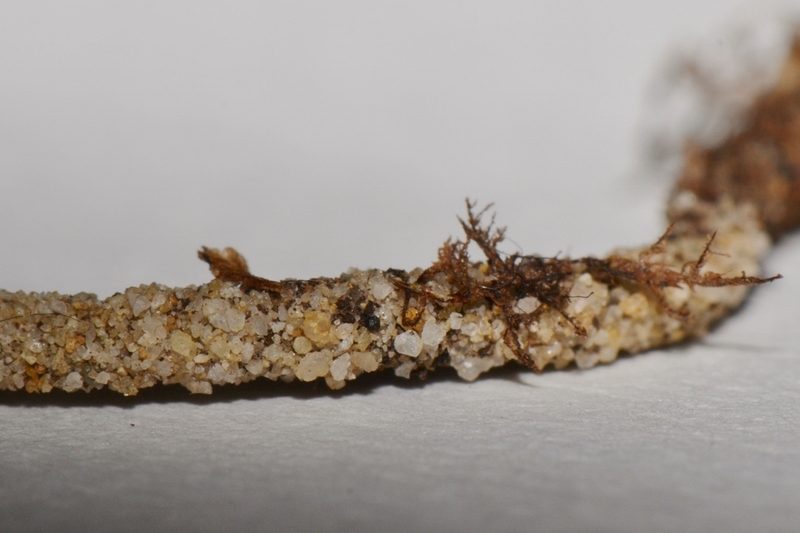 However, the darker colored tubes from the thick hash had a 60% occupancy rate. Perhaps the reason for the difference is the species of midge, or perhaps the abandoned tubes have been transported from the "sweet spots" by the spring's current. 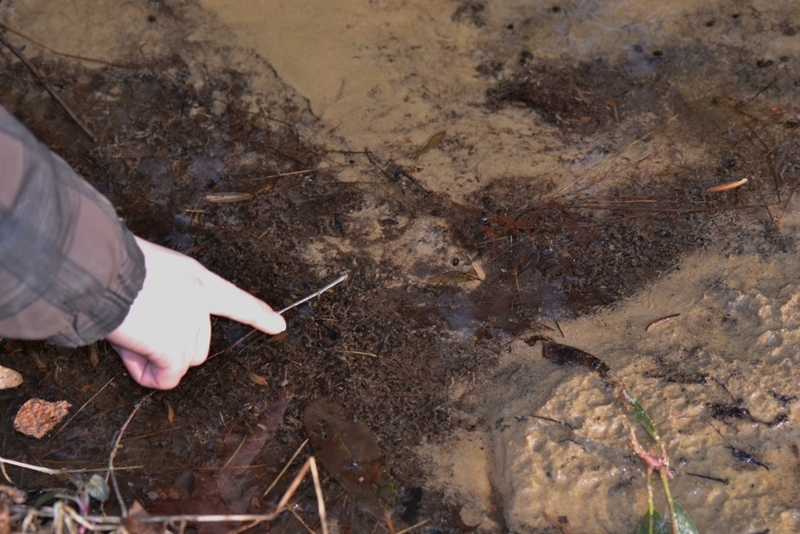 These heaps of midge larvae tubes occur right near the head of the spring... on the left side of the photo below. 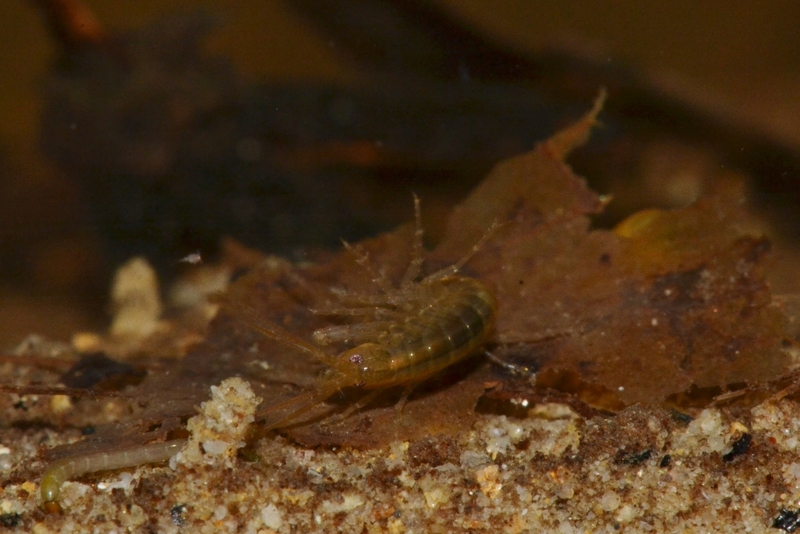 My taking a few handfuls of "stuff" from the bottom of this spring and placing that "stuff' in an aquarium indoors may have sped up the midges' clocks... for their hatching this time of year seems unnatural. 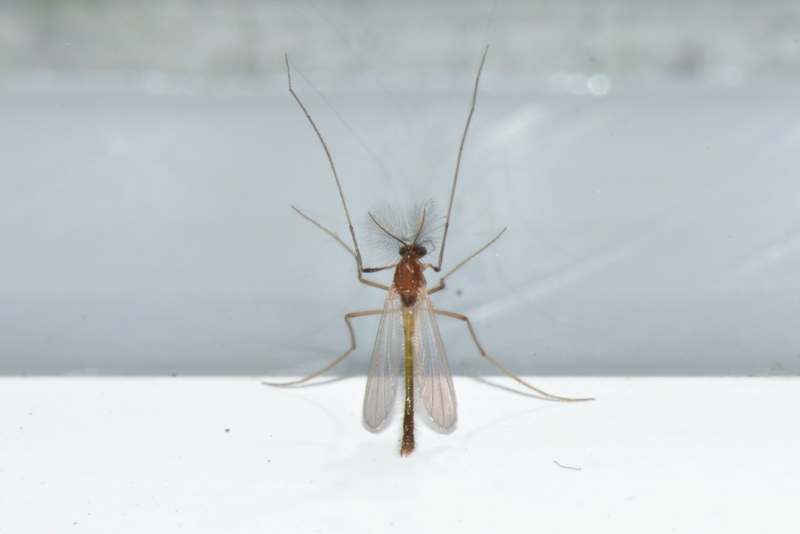 However, my indoor midge hatchery gave me the opportunity to show more of what transpires in this obscure little spring even if it is winter time. ...they want out ... problem is, it's still winter outside. 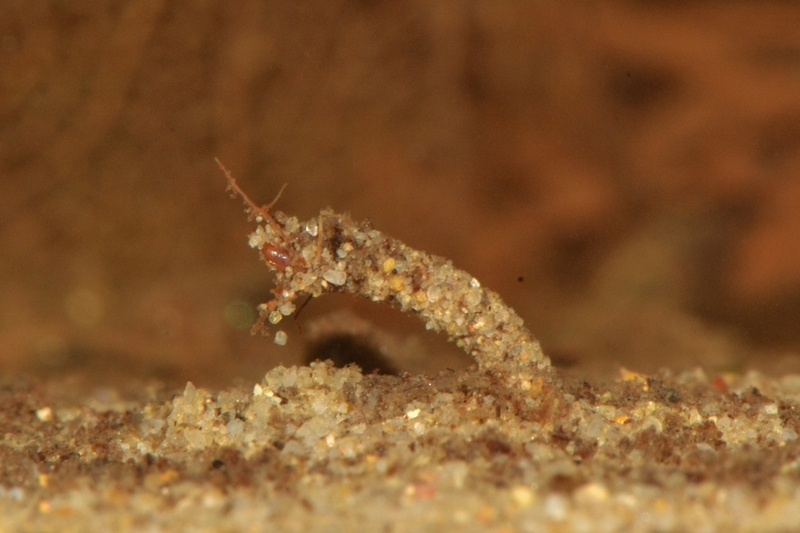 By the way, the scuds are still very active in the sand-spring so I suspect they'll be up next on Nature Posts.